Successfully Added Wine Decanter Pump - Telescopic Tube Suitable For 700ml And More, 4x AAA Battery, High Flow, Energy Efficient, Highly Portable to your Shopping Cart. With this beautiful wine decanter pump, you will be able to fill up your glass in style during upcoming parties with your friends and at family dinners. Not only does this decanter allow you to pour a glass of fine wine with the class it deserves, it also allows you to keep your wine fresh for a longer period of time after opening your bottle. Fit for bottles that contain more than 700ml, this wine decanter pump can be used with all regular sized wine bottles out there. What really sets this decanter pump apart from the others is its wooden wine barrel design, making it a true eye-catcher at any upcoming party. Its compact and portable design additionally lets you conveniently carry it along in your bag – allowing you to bring it with you while attending a party at a friend’s home. 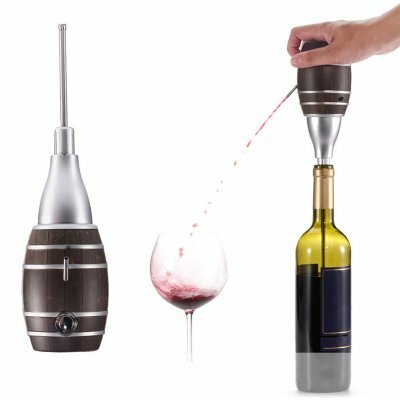 Thanks to its simple to operate design, all you have to do is place the food grade stainless steel sucker into your bottle, hold up your glass, press the button, and you’ll be all set to be served a fine glass of wine. Powered by 4 regular 1.5V AAA batteries, this wine decanter is capable of producing a high-powered stream of wine that fills up your glass in no time. Thanks to its energy efficient pump, you will be able to use it for numerous hours and fill up countless of glasses without needing to worry about running out of juice. Perfect to be used with regular red and white wine, as well as other alcoholic drinks such as cider or amaretto – this decanter pump truly introduces you to a new, fun, and stylish way to fill up the glasses of you and all your friends during upcoming dinners and parties. This wine decanter pump comes with a 12 months warranty, brought to you by the leader in electronic devices as well as wholesale electronic gadgets..
Arabic: - مضخة النبيذ المصفق - Chinese Simplified: - 葡萄酒滗水器泵 - Czech: - Wine Decanter čerpadlo - Danish: - Vin karaffel pumpe - Dutch: - Wijn karaf pomp - French: - Pompe à vin Decanter - German: - Wein Dekanter Pumpe - Hebrew: - דקנטר יין המשאבה - Hindi: - शराब Decanter पंप - Italian: - Decanter vino pompa - Japanese: - ワイン デキャンタ ポンプ - Korean: - 와인 디 켄 터 펌프 - Malay: - Pam Decanter wain - Norwegian Bokmål: - Vin karaffel pumpe - Romanian: - Pompa vin decantare - Russian: - Вина графин насос - Spanish: - Bomba de decantador vino - Thai: - ปั๊มขวดเหล้าไวน์ - Turkish: - Şarap sürahi pompa - Vietnamese: - Máy bơm rượu bình pha lê.